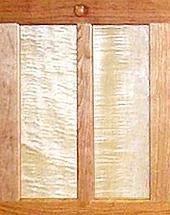 Close up of the beautiful curly maple graining. This desk, 66" L. x 55" H. x 23 1/2" D., made of cherry with figured curly maple panels two doors for storage, two paneled legal size dovetailed drawers with hand made hanging file hardware, and a drop down lid/writing surface. 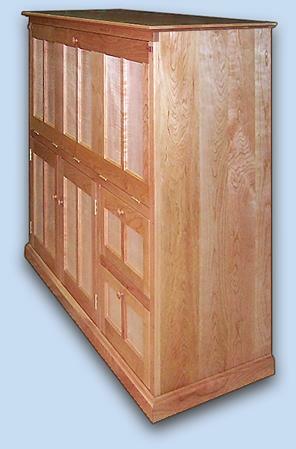 The paneled lid conceals cubby holes, sections for up to 21 inch monitor, keyboard, small partitioned dovetailed drawers, and many storage areas and dividers. This desk has a pull out shelf for ease of use of the fax machine and scanner. We use Knape & Vogt heavy duty drawer slides for the file drawers and pull out shelf hardware. There is room for an ATX case. We custom build each piece, so you may participate in the design. 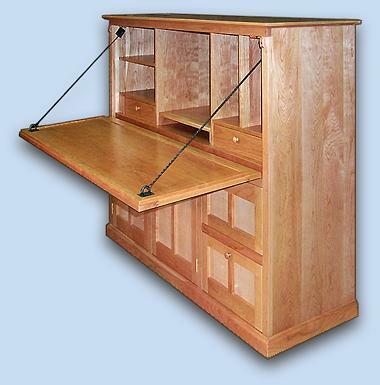 All our furniture is offered in all woods including birch, pine, walnut, oak, or combinations of woods. Upon request we can send you images of other computer desks and computer furniture we have done.